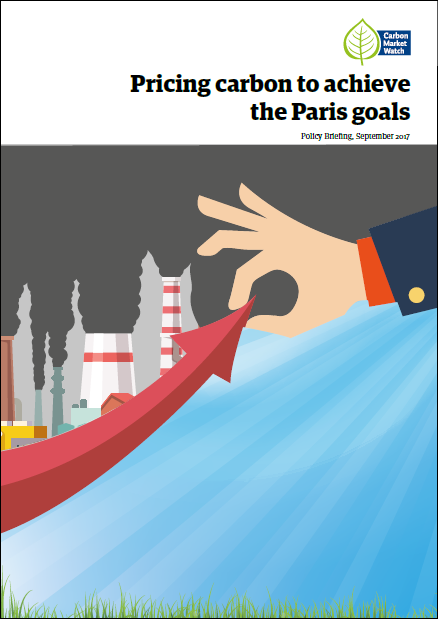 Carbon Market Watch has just released a new policy brief on carbon pricing. Aki Kachi, Carbon Market Watch’s international policy director, gives a brief introduction of what those policies can help achieve and why should civil society get involved. 2017 has among the highest ever recorded temperatures. There were days where it was too hot for planes to fly, and the US and Asia have been battered by several major hurricanes, typhoons, and tropical storms. Other regions of the world have been the victim of droughts, forest fires, heavy rains, and other extreme weather events. Carbon pricing has the potential to be a powerful tool to fight climate change, but not enough countries have a price on carbon, and most countries that have one, have low prices and other policies that undermined its effectiveness. Is it actually possible to accurately put a price tag on all the damage that climate change causes including biodiversity loss, ocean acidification, sea level rise, drought, famine, spread of tropical diseases, extreme weather events, political instability as well as other yet unforeseen effects? That calculation is hard. However, leading economists working with the High-Level Commission on Carbon Prices recently found that a price of at least USD 40-80/tCO2 by 2020 and USD50-100/tCO2 by 2030 is needed to achieve the Paris climate goals. Evidently, carbon pricing can’t do everything. It has to be complemented by equally important other policies to overcome other barriers such as split incentives between owners and renters for energy efficiency, high cost research or development and tech promotion. There are also many things that can undermine a carbon price which need to be phased out, examples fossil fuel subsidies, free allocation of emission permits, tax exemptions, rebates, and carbon offsets. If done well, carbon pricing can offer significant non-climate co-benefits including improved air quality, and revenues which can be used for other like a just transition, other climate measures or to reduce other taxes. Wise reinvestment of revenues can lead to a double dividend of economic growth. Considering these co-benefits carbon pricing simply makes sense and is in a country’s own interest regardless of what other countries do. For those reasons, robust carbon pricing policies need broad support from civil society. Environmental Non-Governmental Organizations (NGOs) and other civil society groups play an important role in robust climate policy, as a vital counterweight to the interests of emitting industries. With this policy brief, we hope to build civil society’s capacity so that it can input on national and international carbon pricing policy making.